From her one-woman studio on Cape Cod, milliner Sally Faith Steinmann creates the equivalent of wearable confectionary – one-of-akind hats for the race track, polo field, show ring, or wedding chapel — as stunning and charismatic as any equine champion. Steinmann, 51, turned a passion for horses, and girlhood joy for dabbling in ribbons and tulle into a successful business, Maggie Mae Designs® (whose custom Derby hats fetch $700 to $1200) and a generous avenue for fund-raising, that has been changing the lives of retired Thoroughbred race horses for the better. This entry was posted in Spring Issue 2011 and tagged auction, derby hats, designer, hat art, hat design, hats, horse, horse art, horses, horses in art, milliner, racehorses, rescue, steinmann. Bookmark the permalink. 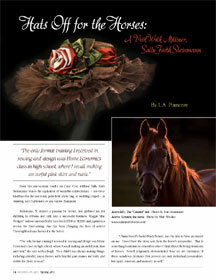 This is one of 3 HIA articles (along with War Horse and FIT/Sporting Life) by your humble HIA writer, L.A. Pomeroy, who is again a finalist in the 2012 American Horse Publications Awards for excellence in journalism in the 2011 publishing year. Thank you, Davina Long, for always assuring such beautiful layout and editorial choices! The article that has helped me get to the finals is one of these!